The Aintree Grand National Festival is fast approaching so keep an eye on this page for the latest upcoming news and tips. 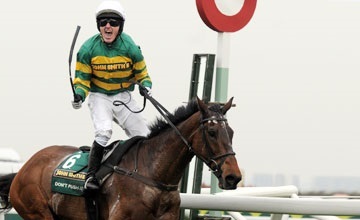 Aintree Grand National winner Don’t Push It, the horse that finally gave champion jockey Tony McCoy his first win in the race at his fifteenth attempt, has been retired after failing to please his trainer on the gallops. While Don't Push It's trainer Jonjo O’Neill felt that the horse was missing his old sparkle and it was better to retire him in good health. Unlike the winner of the Ulster Grand National, Pineau De Re, he will spend his retirement at Martinstown Stud in County Limerick belonging to his owner JP McManus. He won eight races and £750,000 in prize money during his career and also brought a first National victory to both owner and trainer. Don’t Push It was always going to make a chaser and was quickly sent over the bigger obstacles after winning two of his first three races over hurdles. In only his second race over fences he came up against none other than Denman and got within ¾ length of the future Gold Cup winner. His Cheltenham target in 2007 was the Arkle Trophy but he fell 2 out when threatening the leaders. A disrupted season followed and in 2008 he had his first visit to Aintree to contest a Handicap Hurdle, eventually finishing well down the field. His trainer kept him over hurdles in an effort to rebuild his confidence after a couple of disappointing efforts over fences and in January 2009 he chased home Big Bucks. He returned to the larger obstacles at Aintree in April for the John Smith’s Handicap Chase and came home the first of only five to finish in rain-softened ground. Although he was unable to show the same level of form in his subsequent races, the seed had been planted to return for the 2010 renewal of the Aintree Grand National. His prep race for Aintree was the Pertemps Hurdle Final and it did not go to plan as he struggled after an early mistake and was pulled up. His Aintree chance was not immediately obvious until McCoy chose him ahead of stablemate Can’t Buy Time, sparking a nation wide gamble as the horse’s odds tumbled from 25-1 to 10-1 joint-favourite. There had been much speculation about McCoy’s National mount and his great desire to finally win the world’s greatest steeplechase. The race could hardly have gone any better for McCoy as he joined the front-running Bold Apalachi two out before racing clear after the last. In 2011 O’Neill plotted a similar path to Aintree, again running the horse over hurdles at Cheltenham prior to the National. He put in a fine performance but his burden of 11st 10lb eventually proved too much and he had to settle for an honourable third place behind Ballabriggs. The plan had been to train him for another tilt at the Grand National this year but his seasonal appearance over hurdles at Cheltenham in November proved to be his last race.